Last week the gaming industry met in Cologne, Germany. But besides Gamescom, the largest video games convention, another event took place: IGJam, the first game jam at Gamescom. I was one of the lucky participants. This post is going to be a postmortem about the game Koza i Babushka which was a collaborative project. As I started jamming in 2013 with Ludum Dare and #1GAM, on-site game jams (which means, that you are gathering at a specific location for a game jam) are not what I am used to do. The IGJam was my second on-site game jam. The first one was the very nice SemesterGameJam (mini edition) in June 2016, where I created Clichee Wars. As the tag (mini edition) implies, SemesterGameJam was not that big. 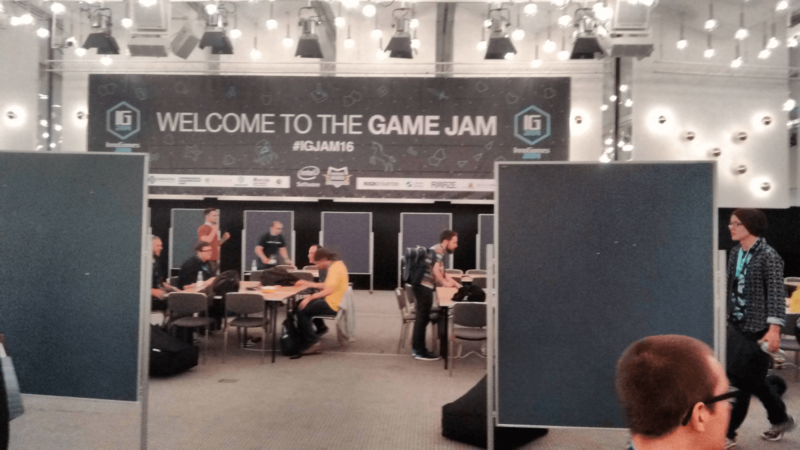 I only realized how big game jams can grow, when I entered the IGJam room at the Koelnmesse conference center. Up to 200 people gathered there to create a game within 48 hours. All the people were very nice and I had many interesting discussions. I really liked the jammers being very diverse. Some developers even came from Indonesia. At first I was a little bit afraid of team building, because I knew no one prior to the jam. But the organizers did an awesome job and everybody found a team quickly. I got to work with three very nice game designers on our project. They worked on graphics, level design, animations and so on, while I worked on programming. For sounds and music there was a separate team, which provided excellent work for most of the teams at the jam. Every jam needs a theme and the IGJam's theme was "Masks", which I personally liked very much. 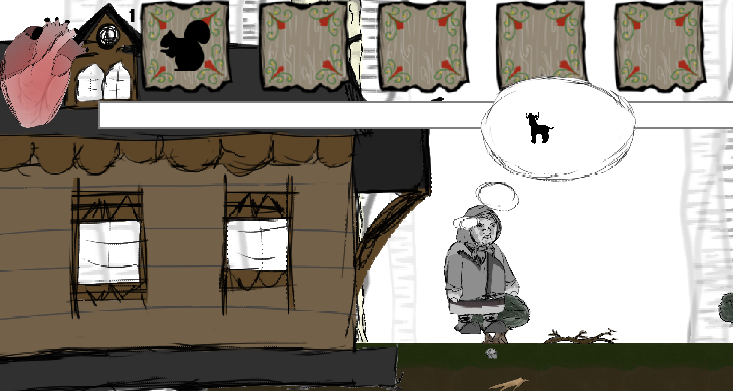 We quickly decided to do a game about a russian woman who is looking for her goat. The old woman can use different animal masks (which you have to find first) to gain the animal's power or ability (like jumping higher, getting smaller or seeing in the dark). Using a mask will drain some of your personality, which you can refill in your house. If you loose all of your personality, the game is over for this run. Dangerous spikes and other obstacles also drain personality. Besides team building and starting the jam on day one, I took some time and checked various booths at Gamescom. This was a great experience, since the last time I visited Gamescom was in 2010. The exhibition was even bigger and really good and inspiring. Back at the jam, we spent the evening with planning our workflow and setting up the basic project. ... was the main day for working on the game. We started importing the level, implemented most of the gameplay features (like climbing on ladders, switching mask, losing and refilling energy. etc..) At some point during the day I felt really overwhelmed by the amount of work that would be needed for the game to be completed, but after starting to write down the tasks and removing the finished tasks, I slowly gained the feeling it would be a very nice game. At the end of day two, there was a feedback round, where we could show our game to the public. Of course none of the games shown there were really finished. The idea to force all teams having a playable prototype after 24 hours is nice, because it forces you to focus on what is important. In the morning of the third day there were only a few hours left and I felt like I was really struggling a lot. The game needed a lot of balancing (which mask uses how much energy?) and the cut scenes (mainly intro and outro) had still to be created. I really crunched for working for the last hours, and we finished 11 minutes before the deadline. I am very proud of the final game. Every post mortem needs to contain a "good vs. bad" section. Criticizing your own game is hard, but I like doing so, because I learn a lot from looking at one of my games some days after finishing. Yesterday I had some friends at my place who played Koza i Babushka and they mainly support my points. Due to time issues on the last day, no one did a play test of the game from start to end. This led to balancing just based on assumptions and gut feeling. It worked out ok-ish, but I had a really bad feeling about this. The game can feel very frustrating due to the high difficulty in the second half. It's permadeath, but we would have needed some sort of checkpoint system. Probably no player is going to play it again after dying 10 steps before the end. Focus: I personally would have loved to be more focused during the jam, especially on the last day. I was jumping between different tasks and solutions, which is not a very relaxed way to work for me. We created a game in 48 hours as a team that never met before. Working in a team with (game) designers is a great opportunity. We really had a precise idea of how the game should feel and what the player's task would be. The game has a remarkable playtime for being created in 48 hours. The level is large and even a speedrun would need about 5 to 10 minutes. The gameplay mechanics, the puzzles and the level design for the first half of the game is great. Many people told me, they had the feeling of exploring a world. Once they bounced into obstacle, they had to search for the solution and were quite happy when they found it. I think the game can be very rewarding, which is a good thing. Working with a dedicated sound team was awesome. Normally I doodle some melodies in cubase and create some blips and blops in SFXR. But this time, the sound was done by professionals and you can clearly hear that. This adds a lot to the mood of the game. The IGJam has been a great experience and I am eager to visit more on-site game jams right away. Next weekend there is Ludum Dare, so August will have been a pretty creative month with three games done.